"I've been a good kitty. How can you tell it's true? Because I'm 'sitting pretty' to melt the heart of you." Artist comment: "This is a portrait of our feline companion 'Katt'. With her soft grey and white, the shadows took on a wonderful lavendar shade. 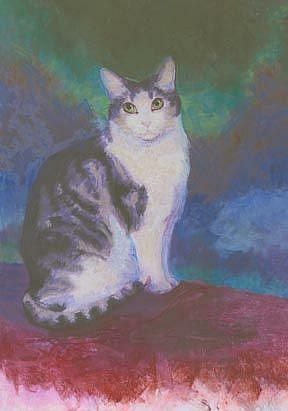 I 'posed' her on a red blanket against a cool backdrop and emphasized her yellow green eyes lined in black. It is a pastel on smooth 80# ultrasmooth white paper." 16 1/2" X 11 3/4"